Liz Hannaford | A non-techy journalist trying to get technical. 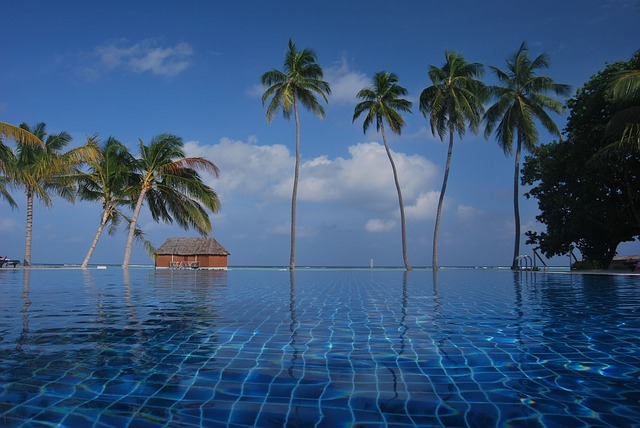 Thank you for following this blog. I really do appreciate your interest. I have now switched to a new address. If you’d like to continue to receive updates about my attempts to become a techy journalist, please click here and subscribe. 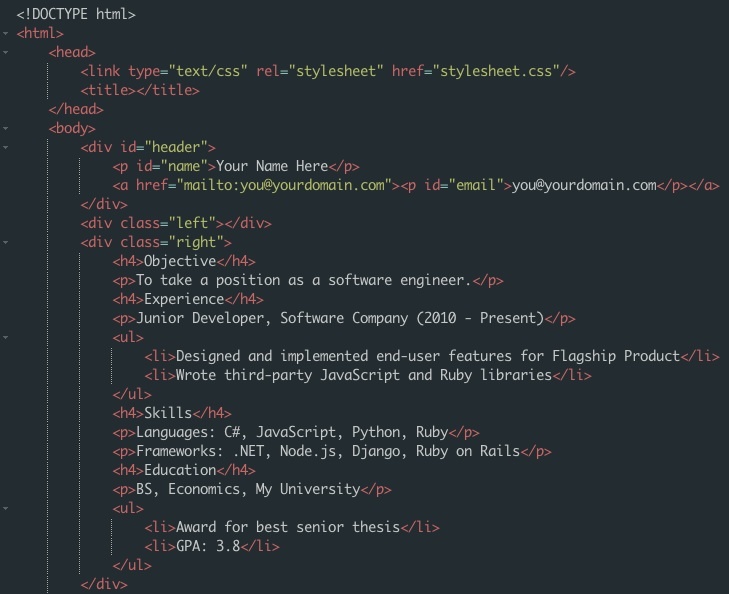 How Codecademy changed my life. So I’ve just finished the HTML/CSS track of Codecademy and I’m left wondering how I’m going to fill my evenings now it’s over. I really enjoyed it – instantly practical and useful and I recommend it to all journalists! I realised how important this stuff was – not just for an old hack like me but for EVERYONE! It’s not boring and it’s not that hard. I started to think about how I could spread the word. What could I do to help other people who had never learnt how to code? 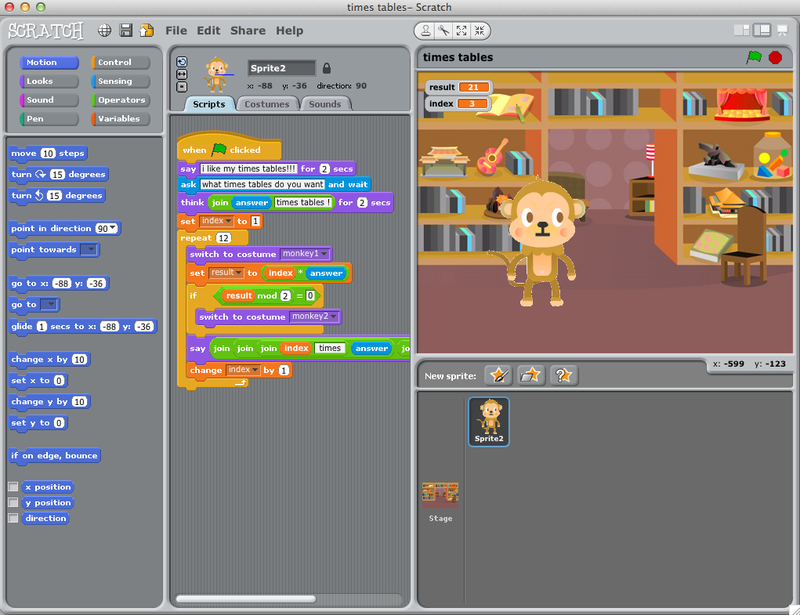 What could I do to help my daughters learn to code because school wasn’t going to teach them? 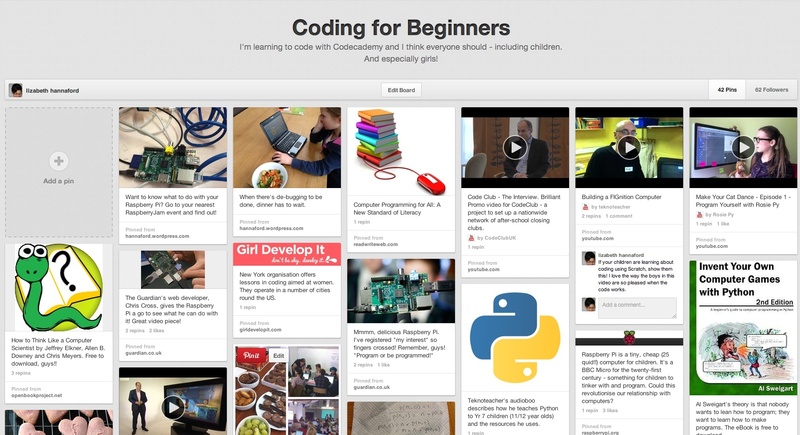 I made a Pinterest board of some of the resources I was finding as I voyaged round the internet looking for programming help for beginners. It’s got followers! Pinterest is a really great way to share resources – much more enticing than a list of hyperlinks, for example. Doing Codecademy gave me the confidence to set up a CodeClub at my daughters’ primary school. I’ve got a couple of real experts on hand to help with the clever stuff but I think the children like the fact that I’m learning too. I’m not patient enough for home educating normally but some of my enthusiasm for learning to code has rubbed off on my daughters. This makes me very happy. This blog has morphed from a blog about journalism education to a blog about learning to code and generally getting techy. I’m thinking about migrating to WordPress.org….. It’s got to be done, hasn’t it?? I’ve become really interested in the rise of the journo-coder in newsrooms. Who are these people and how did they get to be this way? Should journalism departments at universities be doing more to create journo-coders? So those are a few thoughts about how I’ve changed since starting to teach myself code. I’d love to hear your stories too! Never, ever stop learning new stuff because it will open up surprising new doors and keep you away from the TV. 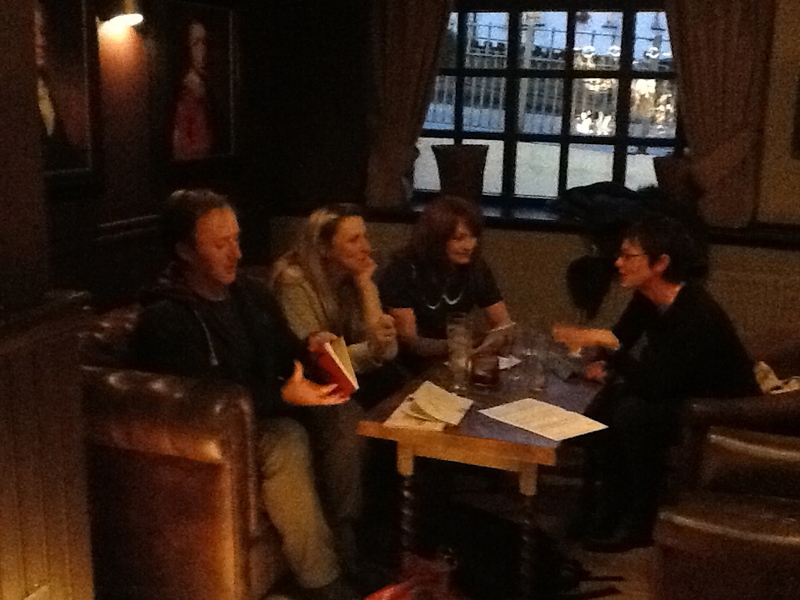 We had our second meet-up on 8th May at the Manchester Chamber of Commerce. Thanks to Steven Flower for organising this. It was really interesting to meet such a range of people keen to get involved in setting up CodeClubs and I hope the “veteran volunteers” were helpful with their practical advice, personal experience and encouragement. We chatted a bit about the HTML projects in Term 3 of CodeClub. One of the volunteers present had already piloted these and so had some useful advice to pass on. I’ll probably blog separately about this! So why were we meeting at the Chamber of Commerce? Manchester has a thriving digital/creative sector. It’s the original tech city, according to MIDAS, Manchester’s inward investment agency. That’s fantastic! But the industry is finding it hard to recruit people with the right digital skills. 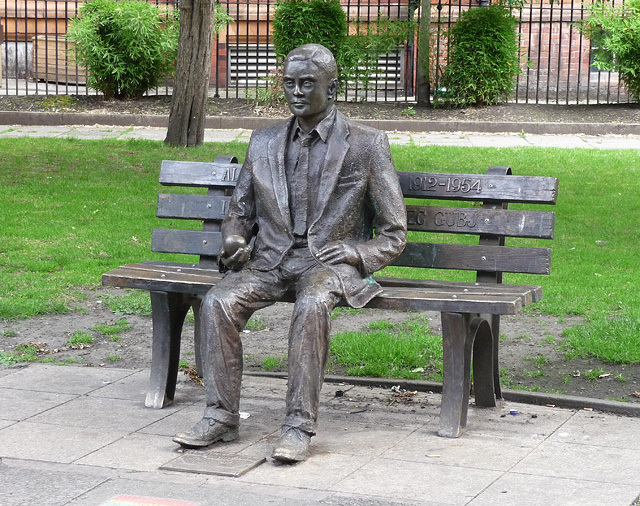 Matthew Kershaw, the Chamber representative for the Digital Infrastructure Group, told us there simply weren’t enough computer programmers in the Manchester workforce these days. That not only makes it difficult to fill vacancies, it inflates salaries making local digital companies less competitive. The digital sector is so worried, its leaders have approached the Chamber of Commerce to ask for something to be done urgently. And they’re willing to throw money at the problem. Their original suggestion was to put a Raspberry Pi in every classroom. On the face of it, this sounds fantastic – very now and a great photo opportunity! But then they thought about it a bit more. Hmm, what were schools going to do with these Pis? The Chamber realised that in most cases, the Pis would just be gathering dust in a corner of the classroom. Sad but probably true. So Matthew Kershaw wanted to ask CodeClub volunteers for our ideas! As enthusiasts already working in primary schools, could we suggest equipment that would help kickstart a knowledge of computing in the next generation? We threw around a few thoughts but eventually reached a very different conclusion. It’s nothing to do with equipment. Most schools have access to computers. The problem is, they don’t know what to do with them. What primary schools lack are the skills and confidence to use the computers they have to teach children to code. If Manchester’s digital sector wants to do something about that, it needs to put people into schools, not raspberry pis. This is something the Chamber had already started work on so we were on very fertile ground here. We discussed encouraging companies to allow their employees to take time off work to volunteer at CodeClubs. We talked about promoting CodeClub to their members. The Chamber already has many school governors amongst its membership so this could be a great resource to tap in to. Perhaps members would prefer to volunteer at the weekend? CodeClubs can now be set up in libraries and other community centres so that needs to be publicised. Just a week after the Chamber of Commerce meeting, I was at the local pub with the volunteers from our Mellor/Marple Bridge CodeClubs. Thanks to Steve Kay for organising this. We currently have CodeClubs at at least two schools in our tiny area so we’re fast becoming a programming hub! One of our main discussion points was what happens to our CodeClub children once they get to the local secondary school? Will there be anything there to develop the skills they’ve learnt in Year 6? We’re going to get in contact with the ICT head at the secondary school to find out more. For example, could they set up their own CodeClub? Volunteers from two local CodeClubs get together to chat about the Big Stuff. We also talked about a joint coding activity so we’re trying to encourage as many of our CodeClub members as possible to go to the next CoderDojo at Manchester’s MadLab. I produced some flyers about it to thrust into parents’ hands. No idea if any of them will turn up…. What I loved about both these meetings was that CodeClub volunteers don’t just talk about their own clubs, projects, problems etc (although we do do a lot of that!). They talk about the Big Picture beyond their immediate school. They see themselves as part of a mission, if you like, to give more and more young children the opportunity to learn these skills. They want to make a difference in the wider community and they have the ideas and commitment to do this. So if you’re already a volunteer, I really do recommend getting together with other volunteers in your area and seeing what you can come up with. It’s great to have the support network around you when you come against problems or when you’ve hit a stumbling block. There are rumours that CodeClub may be going global. So maybe for future meet-ups we’ll need to remember our passports! 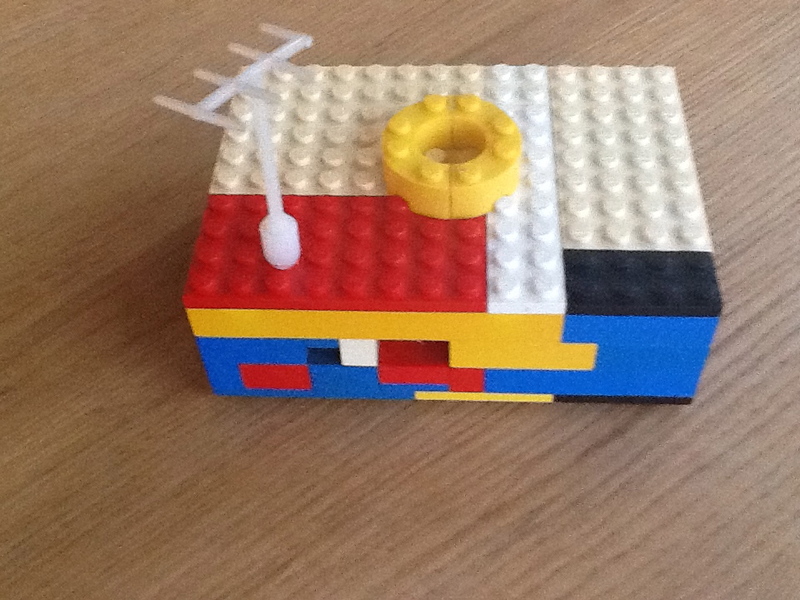 When it comes to making a case for your Raspberry Pi, Lego is really the only way to go. I didn’t have the heart to use my daughters’ shiny, girly pink Lego bricks for this, so we dug out my husband’s Lego from the cellar. 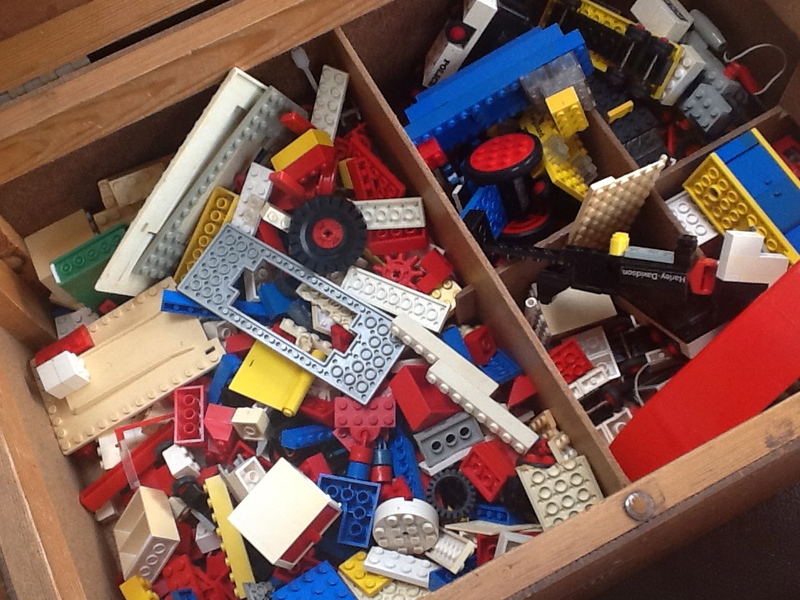 We worked out that some of this Lego is FIFTY YEARS OLD, inherited from an older cousin! Some of it’s a bit discoloured but on the whole it’s in great condition and felt somehow “right” for styling a Raspberry Pi. This is what we came up with. The yellow fruit Polo thing is decorative but also structural. Note the subtle modification to make it WiFi. Saves clogging up another USB port. It got quite a few retweets on Twitter but there was some disappointing scepticism…. So I started thinking about the combination of 50 year old Lego and brand new Raspberry Pi computing technology. What was happening in computing fifty years ago when this Lego was being forged in a Danish furnace? An internet search brought me to the Centre for Computing History. It will be opening to the public in July 2013 in Cambridge but in the meantime its website is full of useful information such as a Computing History Timeline. Cool! I hope you’ll explore those links. And it’s worth pointing out that you’d have needed far more Lego bricks to encase your computer back then…. Just being in Manchester’s Northern Quarter is exciting. It’s very different from our little village! 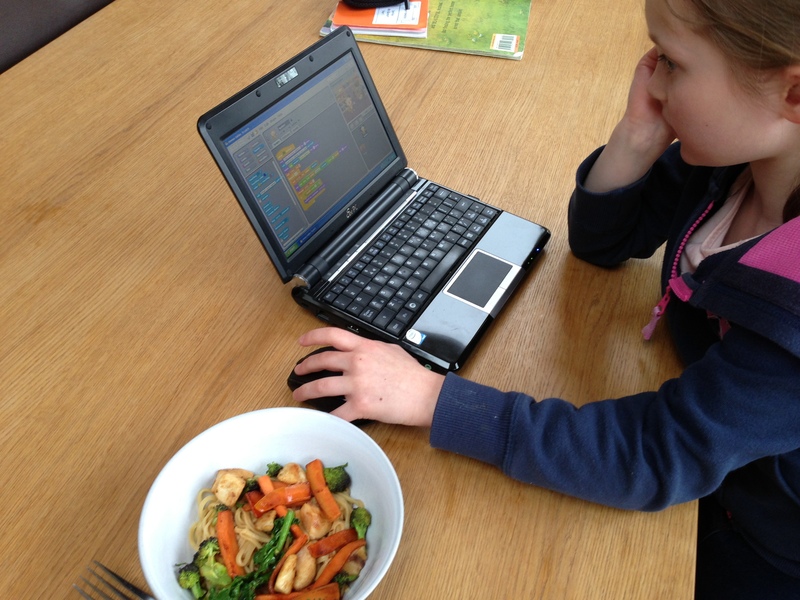 That was Isobel’s plan for her first CoderDojo on 7th April 2013. I just wanted her to enjoy it and didn’t expect her to learn much on her first visit. I thought she’d just be testing the waters, having a look around, seeing if there were other girls her age there (very important when you’re seven). So we decided to make a day of it. The CoderDojo is at the MadLab, right in the heart of Manchester’s Northern Quarter so just wandering around was a bit of an adventure. It was busy and chaotic at the beginning in the best way possible. Isobel hooked up with a couple of other girls her age who are old hands at CoderDojo. They joined a Scratch group aimed at the younger children. It was led by the fabulous, inspiring, endlessly patient DJ Adams who came up with an idea to write a program that would take the monotony out of Times Tables. They all thought this was a much-needed tool! 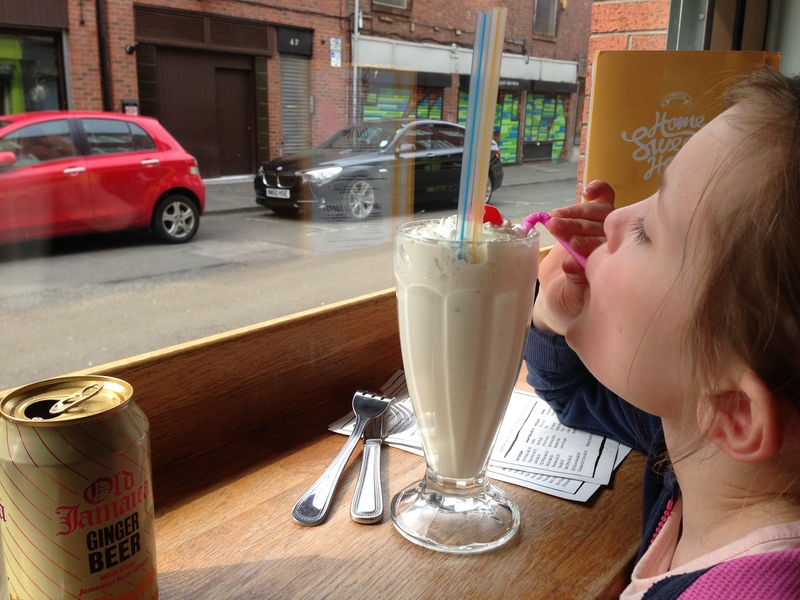 The perfect preparation for a first CoderDojo. Home Sweet Home cafe is almost opposite MadLab (it’s the one with the green shutters) and the milkshakes are delicious! With a mix of gentle questioning, allowing the older children to use their knowledge and experience, he took the group through the process step by step. Isobel’s new friends helped her out a couple of times which made it all the more sociable. It was just lovely to see such young children completely engrossed in a problem-solving task together. Wouldn’t it be great if they could do stuff like this in ICT classes in school? I’d love to see teachers being able to pick up something from elsewhere in the curriculum (times tables is a good example) and then exploring it in a computer class. Even better, after DJ had finished, the girls started chatting about how they could make the times tables program even better! Could they get the monkey to move its mouth? Could he explode at the end?! DJ set Isobel a challenge – could she get the monkey to put its arms out when the answer was even and down when the answer was odd. That got her thinking…. So much interesting stuff going on all over the CoderDojo! Isobel’s new friends dragged her over to see Steven Flower – the organiser of under-18 events at MadLab – make a piano out of bananas. Yeeaaah, the banana piano is good, but Isobel just wanted to get back to her program so she could work on getting the monkey to react to odd and even numbers. 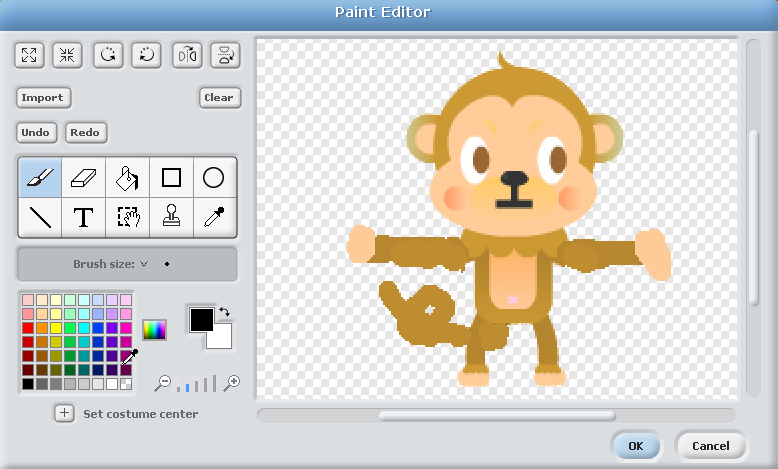 She’s still not sure how to do it but knows she has to make another “costume” for the monkey sprite so gets to work on that. Another wonderfully generous, patient mentor talks Isobel through the modulo operator. Suddenly, she sees a way of solving the challenge. It’s exciting for both of us – but it’s time to leave. Some things are more important than dinner…. She wants to work on it on the train home. I draw the line! But as soon as we get home….. Nothing was more important to Isobel than fixing that program! She still needed guidance to get it to work and it took a lot of trial and error. But she got there in the end. We did NOT make a horse riding game! For me, that was the biggest achievement. I saw a different side to my daughter. Who’d have thought she could be so passionate about something which doesn’t involve writing a story (about ponies, usually)? I met lots of familiar faces at CoderDojo, met new people whom I hope to see again and I came away with lots of new ideas for our CodeClub. 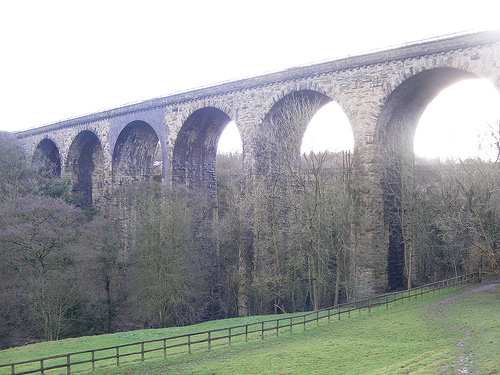 Sadly, we won’t be able to go to the next CoderDojo because it clashes with the Mellor March – the big annual charity event in our village. But we will be back! And finally, I’d like to say thank you to all the wonderful mentors who make CoderDojo such a fantastic experience for children and their parents. I’m very grateful. Digital Journalism is fun in the sunshine! This is a class project I worked on with first year Journalism undergraduates at Salford University, MediaCityUK. It was part of their Digital Journalism module. There are four groups each with about 15-20 students. My aim was to get them to explore audio recording on their smartphones/iPads and to create digital stories using curation techniques. Every week, students complain about the bus service which goes from the main university campus to our MediaCityUK building. It’s free to students on the stretch between the two campuses but it’s unreliable, they tell me. It’s a frequent reason they give me for being late to class! So let’s turn a negative into a positive and use this as the basis for our mobile reporting class. Most students in the class have smartphones or iPads – certainly enough to make this exercise work. Not many have done any serious audio work with them though so there are plenty of learning opportunities here. I’m indebted to Mark Settle at the BBC College of Journalism who specialises in smartphone reporting. His video tutorial on recording audio came out the day after this exercise so it was pretty timely! But my favourite tip came from Nick Garnett, a BBC 5Live reporter. He’s a bit of a pioneer when it comes to iPhone reporting and has pretty much ditched other recording equipment. His blog about his experiments and discoveries is incredibly useful. I’ve always been worried about using the internal mic on the iPhone for serious audio recording because it’s so prone to wind noise but I’m yet to find the perfect external mic solution. 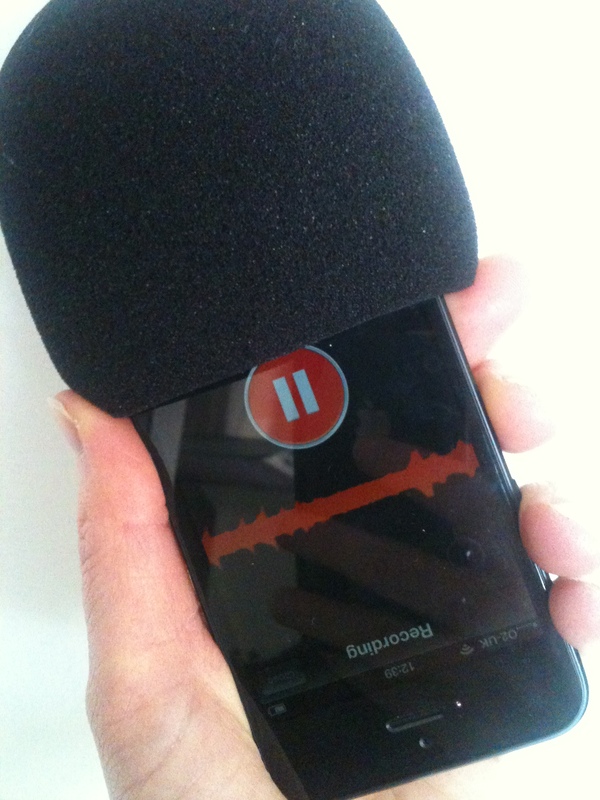 His tip is simple – an ordinary windshield on the microphone end of the iPhone! See my twitter conversation with him about this. So I bought one the day before my first session with the students so I could get them to experiment for me. £4.49 in Maplins! Most students already use Soundcloud for sharing and searching music so this seemed like a good place to start. I set up an account for all our students to use and gave them a quick demo in class, including the simple “top and tail” editing facility. I told them to save their audio as private. Not everybody had devices or 3G but so long as 5 or 6 in the class had it, we were OK. I also showed them Voddio in case some of them were feeling ambitious and wanted to do some proper editing and mixing on the go. Nobody did but that’s probably because you need to pay £6.99 to get the sharing/sending facility on Voddio. The final element was Storify. I love Storify and was really keen to introduce it to my students! Again, I set up an account for the class to use and gave a quick demo. Storify is not perfect and sometimes it doesn’t hook up to Twitter as it should. We had some issues with it in the first two sessions but found a workaround. It was fine the following day with the other two groups. I know some people have given up with Storify completely because of its problems. I’m sticking with it because, when it does all work, it opens up so many creative opportunities for storytelling and engaging. Great teaching tool too. I asked three students in each group to volunteer to man our digital newsroom (an ordinary classroom with PCs). There was no shortage of volunteers, I’m pleased to report! Everybody else teamed up into reporting teams – mostly pairs but some slightly bigger groups. We decided which aspects of the story we were interested in and what kind of audio material we wanted. The newsroom team then took charge of deploying their reporters with additional instructions to take photos and tweet information. Once the reporters were despatched, I briefed the newsroom team in more detail. I gave more instruction on Storify but, to be honest, they didn’t really need it. We talked about what makes good curation. Again, credit here to Mu Lin at Georgian Court University, New Jersey for putting together some guidelines. Basically, don’t drag and dump; provide context and background; have a structure; be selective. One student specifically looked after the Soundcloud material once that started coming through. They listened through to all the material and made public the ones which were good enough for our story. They then alerted the Storify editor to the availability of the material. I also wanted the newsroom team to use social media to engage the broader student community which also relies on this bus service. Could they get people outside this exercise to contribute to the debate? They came up with the hashtag #50busprobs. Once the exercise was over and everybody was back in the classroom, the newsroom team briefed the reporters on what they’d been doing. we published the stories and explained the “notify” option on Storify. I encouraged students to embed/export the Storify to their personal blogs and add a paragraph about their own contribution and analysis of the task. This was not assessed. You can see an example of the stories created by students here just to give you a flavour of what they were able to do in the limited time (about 75 minutes). The newsroom team worked really hard to engage with the broader community with some success. Maybe we should have started doing this in the week before the exercise to build momentum. Working with Storify was great. It’s a really intuitive tool for building digital stories quickly. The students picked up the concept of curation v drag ‘n’ dump really well. They worked together to find relevant background context and structure whilst they waited for the audio material to come in from the field. The students assigned to editing the Soundcloud material quickly worked out what kind of material would work best in a digital story. They also made sure to add titles and, in most cases, relevant photos to each Soundcloud to maximise their visual impact on the final story. The reporters in the field all managed to find interesting audio material and get it back to the newsroom. We also got lots of really useful photographic evidence of buses standing idle round the corner rather then en route! All students reported finding Soundcloud easy and fun to use. The students loved Storify and several of them went away and experimented with it on their own. Really pleased about this! One student said she’d have liked longer for the exercise so that we could have rotated roles. I agree but on the plus side, she said she’d go and experiment with Storify on her own which is a good outcome! Overall, the audio quality needed some work. That was mainly down to lack of editing. They needed to be ruthless with their material! This is largely my fault for not emphasising enough the need to edit BEFORE uploading the material. But on the plus side there was a great range of material and creative use of the medium. They definitely used audio to enhance our appreciation of the story. Interestingly, the students doubted they’d be taken seriously with an iPhone as opposed to a “professional” recording device. That’s at odds with the professionals’ view. I suspect it will change as iPhones become a more acceptable part of the broadcast industry. Watch this space! This was a fun exercise and I would definitely do it again. There is so much learning and thinking involved. The tools worked well. They’re free and easy to learn and use straightaway so everyone benefits.